45/47 Amanda Jones Muddy action movie wannabe that felt somehow like an afterthought of itself. 60/68 Michael Bentley To think that Bruce Willis was once one of the world's leading action movie stars. 114/159 David Mumpower I adore Mos Def but his vocal inflections in 16 Blocks made me want to slap the taste out of his mouth. 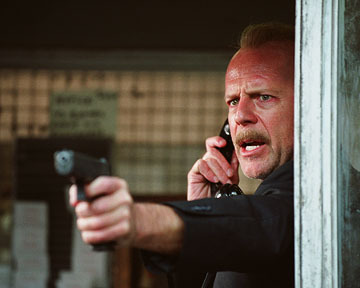 Bruce Willis teams up with Lethal Weapon helmer Richard Donner in this thriller. It's an ideal pairing in many ways, as Donner has experience in the types of action films that made Willis a star have been Donner's forte in the past. In the film, Willis will play an aging NYPD cop who gets the unfortunate assignment of escorting a hapless (but upbeat) witness a distance of 16 blocks from the police station. Trouble is, there's a lot of people who really don't want the witness to make it there alive. Compounding the problem is the fact that Willis's character is a grumpy sort of guy who really just doesn't match up well with his charge's sunny point of view. See the latest developments for this project on the 16 Blocks Movie News page.